People in Haiti needing help: 3 million. Bodies collected for disposal so far: 9,000. Number of people being fed daily by the United Nations' World Food Program: 8,000. The numbers behind the outpouring of earthquake assistance are giant. But they are dwarfed by the statistics indicating the scope of the disaster in Haiti, the number of victims and their deep poverty. "The level of need is going to be significantly higher" than many previous disasters, said Dr. Michael VanRooyen, director of the Harvard Humanitarian Initiative. Here are some numbers, with the proviso that figures are estimates that are constantly changing. Current death estimates: The Red Cross says 45,000 to 50,000 people have died. The Pan American Health Organization puts the number between 50,000 and 100,000. 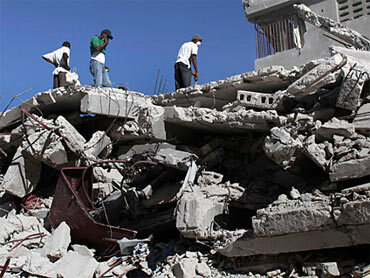 A senior Haitian official said Friday that the death toll from the earthquake , the Reuters news agency reported. Bodies collected for disposal so far: 9,000. An additional 7,000 corpses were reportedly placed in a mass grave. •	People needing help: 3 million. •	Percent of buildings damaged or destroyed: Up to 50 percent. •	Hospitals or health facilities in Haiti damaged, forced to close: eight. •	Patients treated by Doctors Without Borders initially: more than 1,500. •	Search-and-rescue teams on ground or en route Friday: 38. •	Homeless people in Port-au-Prince: at least 300,000. •	Water needed daily: 6 to 12 million gallons (enough to fill 18 Olympic sized swimming pools a day). Kate Conradt, chief spokeswoman for Save the Children, said that the challenge ahead cannot be overcome in a few days or weeks. "This is a long-term disaster," she said in a telephone interview from Port-au-Prince. Helping Haiti "is going to take far more than we ever could imagine," VanRooyen said. So in response, the world has opened its wallets. •	United Nations Emergency appeal for aid: $550 million. •	United States pledge of aid: $100 million. •	European Commission's initial spending: 3 million Euros. •	Total pledge of aid by governments around world: $400 million. •	Number of governments that have sent aid so far: more than 20. •	International Red Cross' initial emergency appeal goal: $10 million. •	Amount of money raised by Save The Children: $7 million. •	Amount of money pledged by George Soros: $4 million. •	Amount of money raised by the Salvation Army and some other charities: more than $3 million. •	Number of people being fed daily by U.N.'s World Food Program: 8,000. •	Number of people a day WFP hopes to feed within 15 days: 1 million. •	Number of people a day WFP hopes to feed within one month: 2 million. •	Amount of food salvaged by WFP in damaged Haitian warehouse being distributed: 6,000 tons (out of a total of 15,000 tons stored before the earthquake). •	Meals prepared and freeze dried by the Salvation Army in Kansas and Iowa to ship to Haiti: 1.28 million, weighing nearly 200,000 pounds. •	Number of trucks carrying bottled water being trucked in from neighboring Dominican Republic: 13. •	UNICEF initial shipment of rehydration liquids, water-purification tables, hygiene kits and tents: enough for 10,000 people. •	Size of Doctors Without Borders initial relief package: 25 tons. •	International Red Cross pre-positioned relief supplies: enough for 3,000 families. •	Plane of Red Cross supplies sent Thursday: 40 tons. •	Body bags sent by Red Cross on Thursday: 3,000. "We are seeing overwhelming need within the city and increasingly desperate conditions," Conradt said. "We visited two camps today with 5,000 people and only four latrines total. We were told that the number of people there doubles at night, but during the day they are looking out for food, water and family members." Camps like that are all over Port-au-Prince. And this is a country that before Tuesday's earthquake was the poorest in the Western Hemisphere and one of the poorest worldwide. More than half of Haiti's 9 million people live on less than $1 a day, even before the earthquake, according to the United Nation's World Food Program. The World Bank said the average Haitian lives on just $1,180 a year. Nearly half of Haiti's population is hungry and only half had access to safe drinking water before the earthquake, according to the World Food Program. Nearly 60 percent of Haiti's children under 5 are anemic. •	Americans in Haiti when earthquake struck: 45,000. •	Number of Americans evacuated from Haiti: 846. •	Number of Americans confirmed dead: six. •	Number of Canadians dead: four. •	Number of United Nations worker in Haiti when earthquake struck: 12,000. •	Number of UN workers confirmed dead: 37. •	Number of UN workers missing: 330. •	Number of Dominicans dead: six. •	Number of Brazilians dead: 15. •	Number of Europeans dead: six. •	Number of staffers of Christian humanitarian agency World Vision: 370. •	U.S. troops there to help or possibly on their way: 10,000. •	Haitian Red Cross volunteers: 1,700.